Effects of greater snowfall are lasting in some regions. pictures of June 29, 2015 and 16 are marked upper left corner. But the great deal of snow during winter of 2015-16 affected sea ice morphology, and therefore its current cooler summer weather. Near North Pole current Ice condition, between a rock frozen ice and a cloudy cooler place. 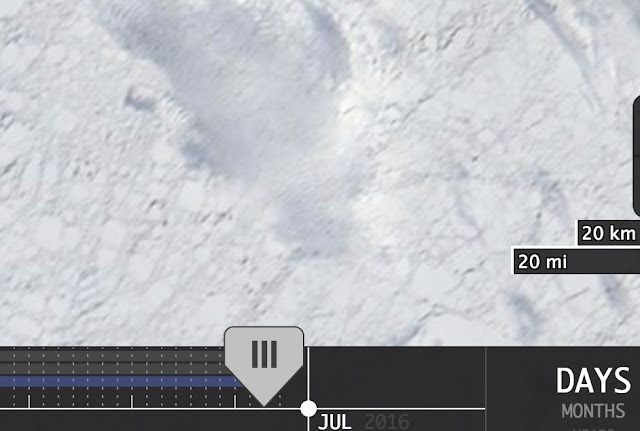 June 28,2016, near North Pole ice conditions show "pancakes" typical of fluid sea ice, terribly broken up. Very little sign of old ice. But there was extensive compression during the Spring just past, this can be its undoing, a strong consolidated pack cools the air more, good spawning ground for Highs. NASA EOSDIS 11 days of June 2016 selected at about 2 or 3 day intervals. You can see cyclones moving through along with contrarian winds, there were quite a few small cyclones hanging about during the same period. But nothing , literally nothing stopped the surface current moving the ice clockwise. 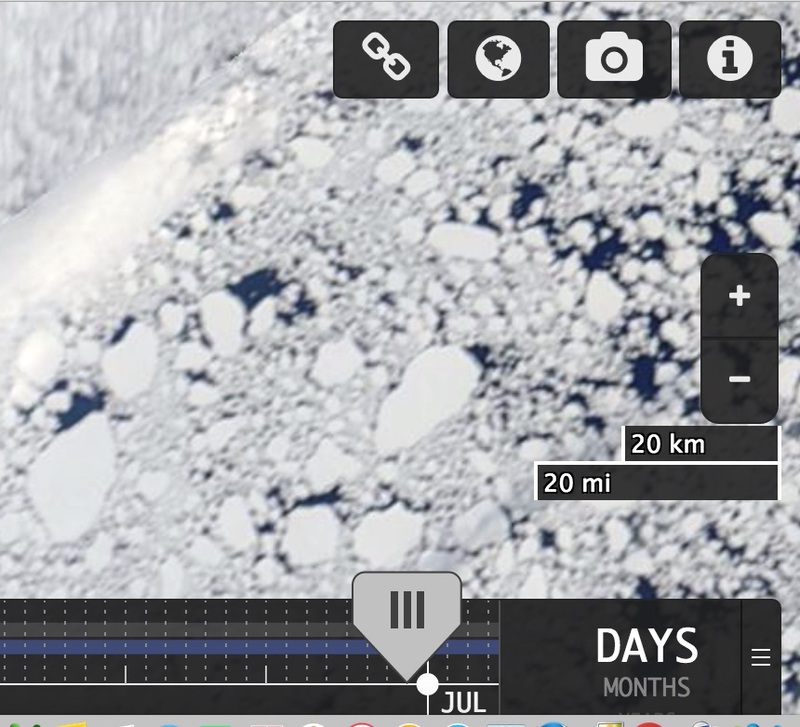 This is explainable by 3 of many sea ice displacement vectors. The coriolis effect, note its not a force, sea ice momentum movement (a seldom discussed displacement vector) and finally the Beaufort Gyre itself, reinvigorated by months of clockwise circulation of mixed aged pack ice. This implies any lull in winds will cause compaction to occur nevertheless. wd June 27 2016. Having dealt before with doubtful calculations output by NOAA NCAR/NCEP with respect to top sea ice temperature, it seems suspicion confirmed by remote weather stations placed on sea ice. The ice core temperature minimum of 2015f (82 N 147 W) in particular on June 5 was really cold with lowest sun position, but as usual, solar radiation whacked out any precision with top thermistors most times, leaving us with only its average surface temperature to contemplate. It was -4.8 C for that day. At the same location NCAR/NCEP calculated -3. Now consider that an actual measurement can be done from space, the skin temperature or ice surface, it should be quite precise. NCAR/NCEP result was between -1 and 0 C. However, this is a violation of sea ice refraction prime rule, top of sea ice was never observed warmer than surface air. To cap this off, 2015f reported 12:00 UTC surface temperature at -7.39 C, now we turn to nearby sea ice surface weather stations at 12:00 UTC 80 N 110 W read -1, 76 N 160 W read -2. Welcome to the world of metric confusion, when temperatures seem really irregular. Another surface Auto station on Prince Patrick Island reported a more probable -7 (76 N 120 W). To make sense of all this, one must weed out possible errors, to play it safe, only 2015f surface measurements seem accurate along with surface temperature from land based auto station. Why so? Because thermistor 2, likely in ice, recorded -6.7 C at 12 UTC, with a low sun solar radiation corruption. Later, the morning less bombarded with photons thermistor shoots up 5 C in 8 hours with higher sun. 2015f reported surface temp -2.9 C at 20:00 UTC while same colder morning thermistor reported +0.17 C, one would expect similar rise in temperature between surface and top of sea ice, but sea ice gained more degrees than surface measurement, again highly unlikely since sea ice and snow have very strong albedo, unless of course there is water on the said thermistor surrounded by sea ice. No wonder Arctic models have trouble being precise, there is very little accurate observations to compare their output with. June 5 1200 UTC CMC surface analysis. NOAA surface skin analysis, apparently the sea ice average temperature was warmer than the surface air over most locations. Mass Buoy 2012f recorded an average surface temperature -4.8 C, 3 degrees colder than model skin temperature calculation.